Join Mario on a massive, globe-trotting 3D adventure and use his incredible new abilities to collect Moons so you can power up your airship, the Odyssey, and rescue Princess Peach from Bowser's wedding plans! This sandbox-style 3D Mario adventure  the first since 1997's beloved Super Mario 64 and 2002's Nintendo GameCube classic Super Mario Sunshine  is packed with secrets and surprises, and with Mario's new moves like cap throw, cap jump, and capture, you'll have fun and exciting gameplay experiences unlike anything you've enjoyed in a Mario game before. Get ready to be whisked away to strange and amazing places far from the Mushroom Kingdom! 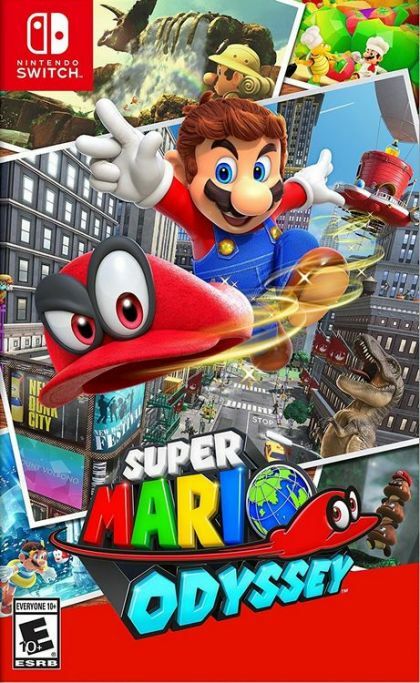 Explore huge 3D kingdoms filled with secrets and surprises, including costumes for Mario and lots of ways to interact with the diverse environments  such as cruising around them in vehicles that incorporate the HD rumble feature of the Joy-Con controller or exploring sections as Pixel Mario. A set of three new amiibo figures (sold separately)  Mario, Princess Peach and Bowser in their wedding outfits  will be released at launch. Some previously released amiibo will also be compatible with this title. You can tap supported amiibo to receive gameplay assistance  some amiibo will also unlock costumes for Mario when scanned!